Every year since 2010, I’ve undertaken a fairly massive project in which I’ve reviewed the previous twelve months’ education and technology news in order to write ten articles covering “the top ed-tech trends.” This is how I spend my November and December – researching and writing a series that usually tops out at about 75,000 words – which I didn’t realize until print copies were made for my visit here is about 240 pages. 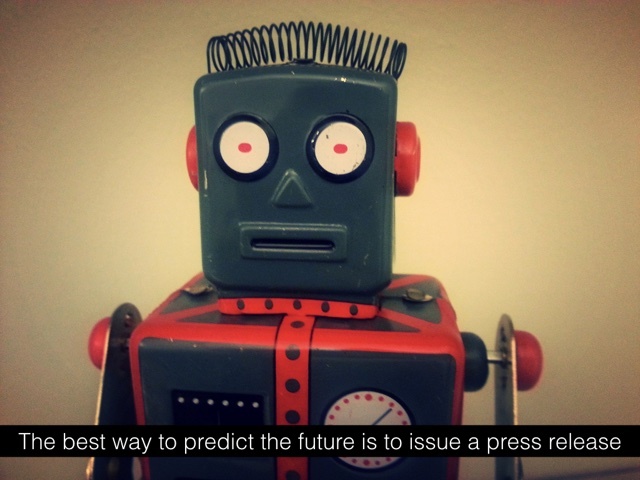 Last year, I gave a lecture at Virginia Commonwealth University titled “The Best Way to Predict the Future Is to Issue a Press Release.” (The transcript is on my website.) It was one articulation of what’s a recurring theme in my work: we must be more critical about the stories we tell and we’re told about the future of education. Indeed, we need to look at histories of the future and ask why certain people have wanted the future to take a certain shape, why certain technologies (and their stories) have been so compelling. To be clear then when when I write my “trends” series, it’s not meant to be predictive. Rather it’s a history itself – ideally one that’s useful for our thinking about the past, present, and future in the way in which the study of history always should be. It’s a look back at what’s happened over the course of each year, not simply – to counter that totally overused phrase from hockey player Wayne Gretsky’s dad – to “skate to where the puck is going,” but to examine where it has been. And more importantly, to ascertain where some folks – those who issue press releases, for example – want the puck to head. 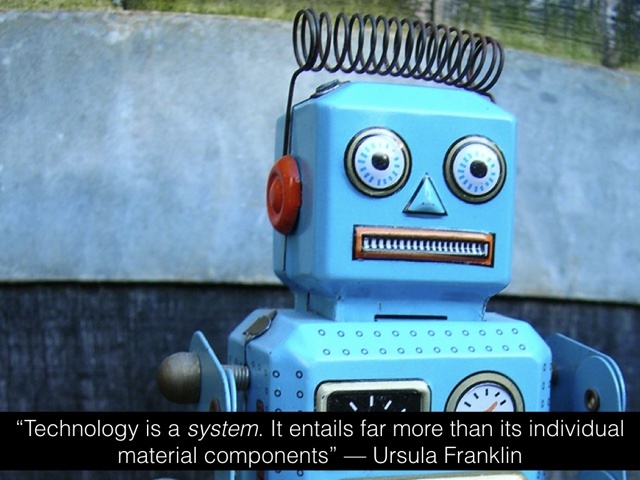 So I am not here to tell you, based on my analysis of ed-tech “trends,” what new tools you should buy or what new tools you should incorporate into your teaching or what old tools you should discard. 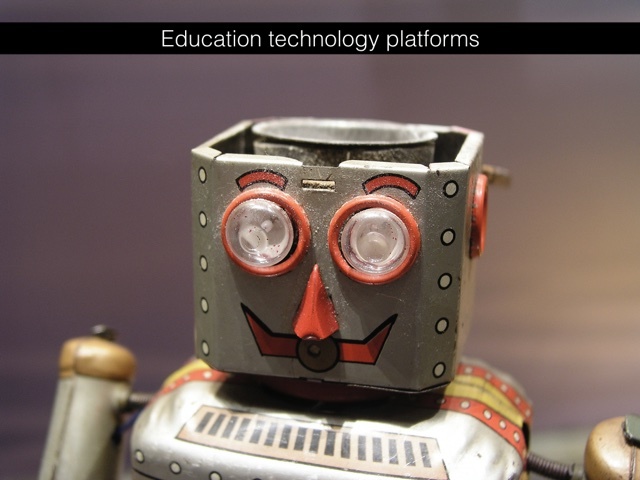 That’s not my role – I’m not an advocate or evangelist or salesperson for ed-tech. That’s not the point of my work. I’m not a consultant hired to talk you through the implementation of your next project. My work is not “market research” in the way that “market research” typically functions (or in the way “market research” hopes it functions). According to the press releases at least, ed-tech markets are always growing larger. The sales are always increasing. The tech is always amazing. I want us to think more critically about all these claims, about the politics, not just the products (perhaps so the next time we’re faced with consultants or salespeople, we can do a better job challenging their claims or advice). As you can see, much of what I write isn’t really about technologies at all, but rather about the ideologies that are deeply embedded with them. 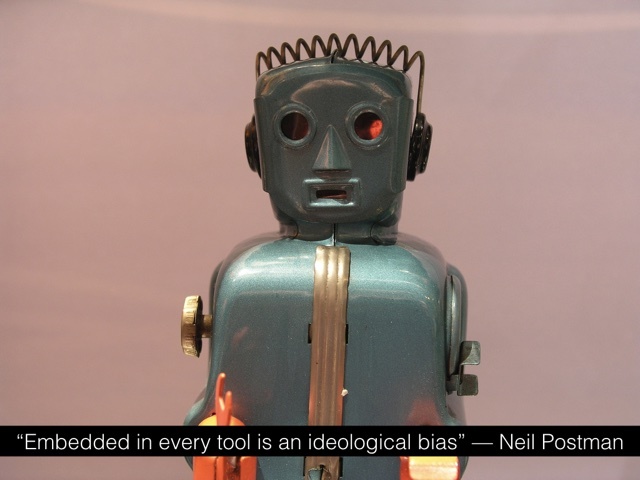 I write about technologies as practices – political practices, pedagogical practices – not simply tools, practices that tools might enable and that tools might foreclose. Throughout the year, I follow the money, and I follow the press releases. I scrutinize the headlines. I listen to stories. I try to verify the (wild, wild) claims of marketers and salespeople and politicians. I look for the patterns in the promises that people make about what technologies will do for and to education. 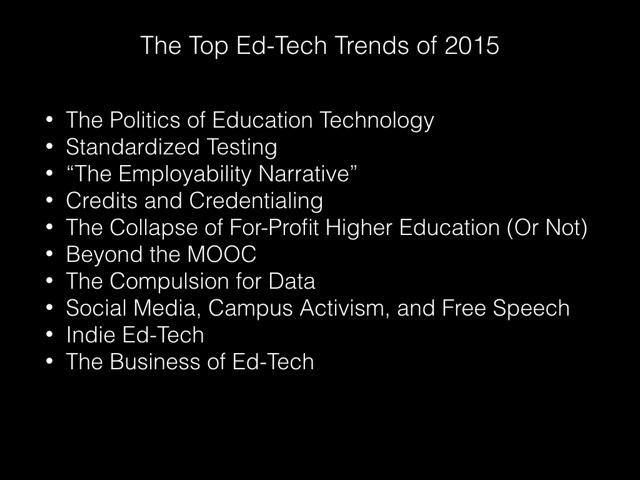 And it’s based on these patterns that I eventually select the ten “Top Ed-Tech Trends” for my year-end review. They’re not “trends,” really. They’re themes. They’re categories. They’re narratives. And admittedly, because of my methods, how I piece my research together, they’re narratives that are quite US-centric. I’d say even more specifically, they’re California- and Silicon Valley-centric. Silicon Valley is itself just one part of Northern California, one part of the San Francisco Bay area – the Santa Clara Valley. Santa Clara Valley’s county seat and the locus of Silicon Valley (historically at least) is San Jose, not San Francisco or Oakland, where many startups are increasingly located today. Silicon Valley does include Mountain View, where Google is headquartered. It also includes Cupertino, where Apple is headquartered. It includes Palo Alto, home to Stanford University, founded in 1885 by railroad tycoon Leland Stanford. The “silicon” in “Silicon Valley” refers to the silicon-based integrated circuits that were first developed and manufactured in the area. 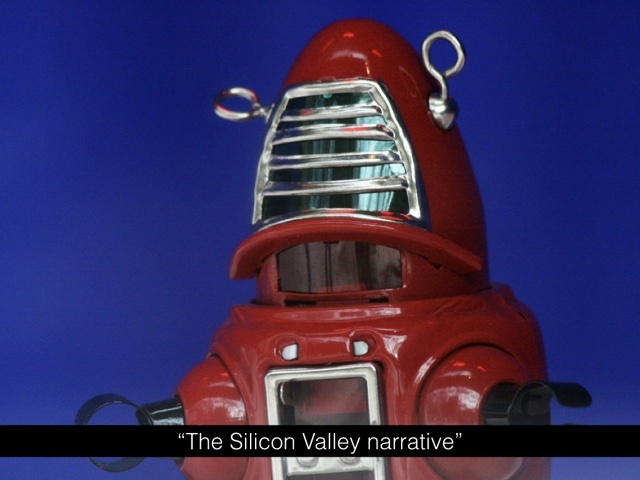 But I extend the phrase “Silicon Valley” to all of the high tech industry, not just the chip makers. And those chip makers aren’t all located in the area these days. Arguably the phrase “Silicon Valley” obscures the international scope of the operations of today’s tech industry – tax havens in Ireland, manufacturing in China, and so on. But if the scope is international, the flavor is distinctly Californian. A belief in the re-invention of the self. A “dream factory.” A certain optimism for science as the penultimate solution to any of the world’s problems. 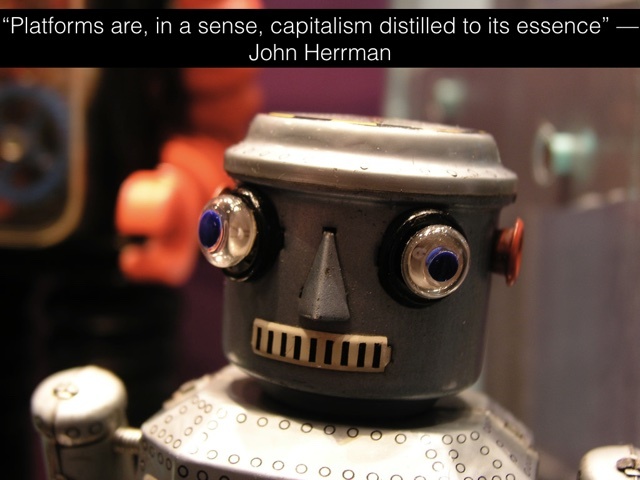 A belief in technological utopia. A belief in the freedom of information technologies, in information technologies as freedom. An advocacy for libertarian politics – think Peter Thiel (a Stanford graduate) now advising Donald Trump. A faith in the individual and a distrust for institutions. A fierce embrace of the new. A disdain for the past. California – the promised land, the end-of-the-road of the US’s westward (continental) expansion, the fulfillment of Manifest Destiny, colonization upon colonization, the gold rush, the invention of a palm-tree paradise. The California too of military bases and aeronautics and oil. California, the giant economy. 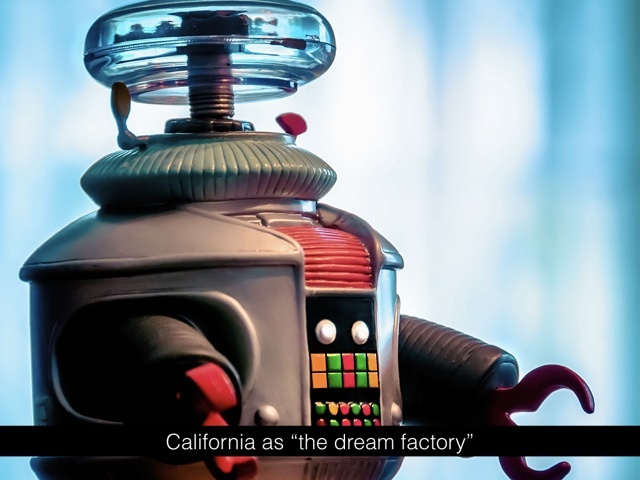 The California that imagines itself – and hopes others imagine it – in Silicon Valley and Hollywood but not on the farms of the Central Valley. The California that ignores race and labor and water and war. Despite thinking of themselves as liberal-learning, today’s tech companies re-inscribe much of this. “Everyone should learn to code,” as they like to tell us. “Higher education is a bubble,” as Peter Thiel has said. “Disrupt.” “Unbundle.” “It’s like Uber for education.” And so on. “The Californian Ideology,” as Richard Barbrook and Andy Cameron described all this in their terrifically prescient essay from 1995, does not tend to make many lists of the “top ed-tech trends.” But the ideology permeates our digital technologies, whether we like it or not. And if and when we ignore it, I fear we misconstrue what’s going on with Silicon Valley’s products and press releases. 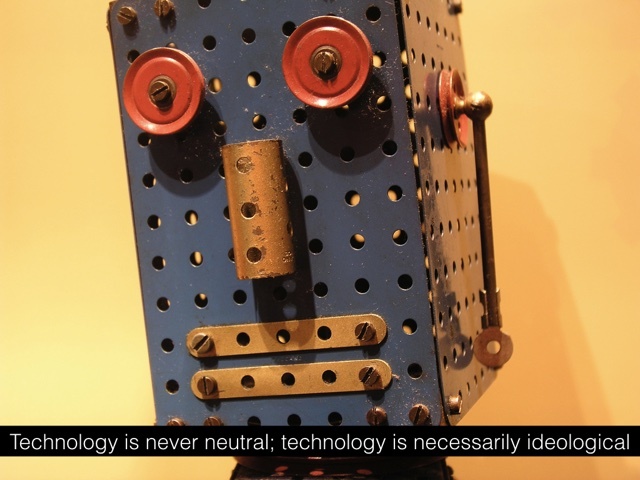 Most people, it would seem, are happy to assume that educational technologies are “neutral” tools that are essentially free from values and intent (or, at most, shaped by generally optimistic understandings and meanings associated with educational change and improvement). 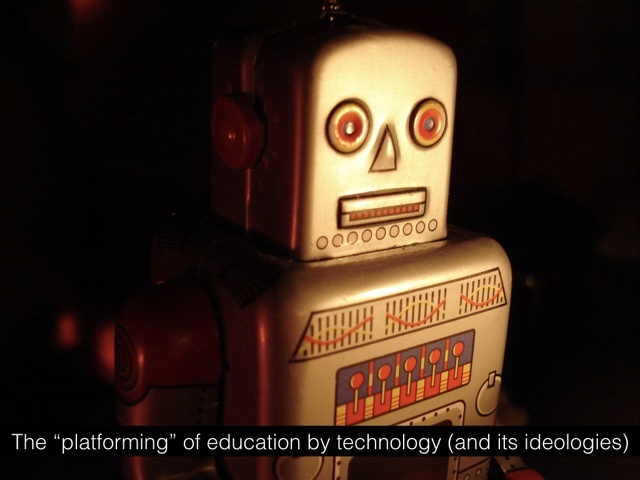 In this sense, it is difficult at first glance to see educational technology as entwined with any aspect of the dominant ideologies just described. Yet, as was noted earlier, one of the core characteristics of hegemony is the ability of dominant ideologies to permeate commonsensical understandings and meaning. Following this logic, then, the fact that educational technology appears to be driven by a set of values focused on the improvement of education does not preclude it also serving to support and legitimate wider dominant ideological interests. Indeed, if we take time to unpack the general orthodoxy of educational technology as a “positive” attempt to improve education, then a variety of different social groups and with different interests, values and agendas are apparent. …While concerned ostensibly with changing specific aspects of education, all of these different interests could be said to also endorse (or at least provide little opposition to) notions of libertarianism, neo-liberalism and new forms of capitalism. 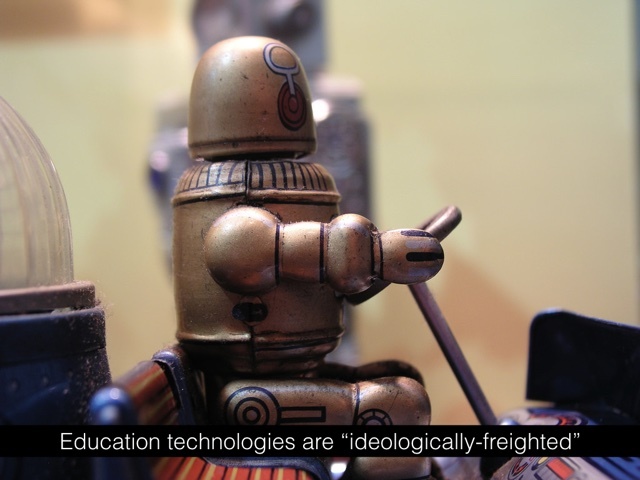 Thus educational technologies can still be said to be “ideologically freighted”, although this may not always be a primary intention of those involved in promoting their use. I’d add another ideological impulse that Selwyn doesn’t mention here: that is, a fierce belief in technological solutionism (I’m building on Evgeny Morozov’s work here) – if students are struggling to graduate, or they’re not “engaged,” or they’re not scoring well on the PISA test, the solution is necessarily technological. More analytics. More data collection. More surveillance. Personalization. Platforms. These aren’t simply technological innovations. They are political, social – shaping culture and politics and institutions and individuals in turn. 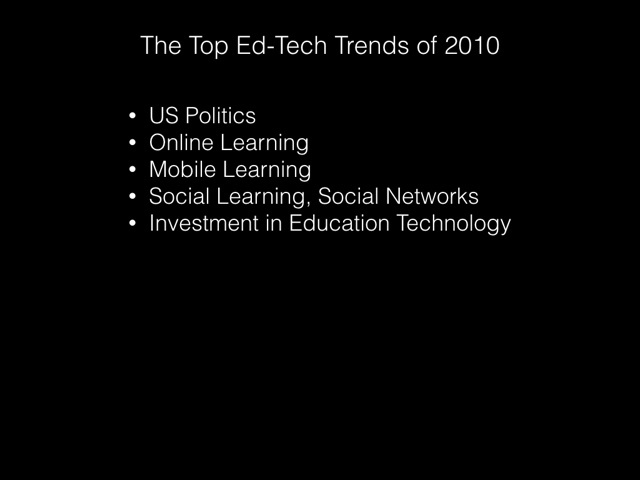 In 2012, I chose “the platforming of education” as one of the “top ed-tech trends.” I made that selection in part because several ed-tech companies indicated that year that this was what they hoped to become – the MOOC startups, for example, as well as Edmodo, a social network marketed to K–12 schools. And “platforming” was a story that technology companies were telling about their own goals too. To become a platform is to be “the next Facebook” or “the next Google” (and as such, to be a windfall for investors). Platforms aim to centralize services and features and functionality so that you go nowhere else online. They aspire to be monopolies. Platforms enable and are enabled by APIs, by data collection and transference, by data analysis and data storage, by a marketplace of data (with users creating the data and users as the product). They’re silos, where all your actions can be tracked and monetized. In education, that’s the learning management system (the VLE) perhaps. I wondered briefly last year if we were seeing a failure in education platforms – or at least, a failure to fulfill some of the wild promises that investors and entrepreneurs were making back in 2012. A failure to “platform.” Despite raising some $87.5 million in venture capital, for example, Edmodo hadn’t even figured out a business model, let alone become a powerful platform. Similarly MOOC startups have now all seemed to pivot towards corporate technology training, but certainly all corporate training isn’t running through these companies. Neither Coursera nor Udacity nor edX have become corporate training platforms, although perhaps that’s what Microsoft hopes to become, as a result of its acquisition of the professional social network LinkedIn, which had previously acquired the online training company Lynda.com. The platform comes with a comprehensive curriculum developed by teachers in classrooms. The base curriculum is aligned with the Common Core, and each course includes meaningful projects, playlists of content and assessments, all of which can be customized. Teachers can adapt or create new playlists and projects to meet their students’ needs. “Playlists” – this seems to be one of the latest buzzwords connected to personalization. “Students build content knowledge by working at their own pace and take assessments on demand,” the Summit website says. But while students might be able to choose which order they tackle the “playlist,” there isn’t really open inquiry about what “songs” (if you will) they get to listen to. AltSchool is another Silicon Valley company working on a “personalized learning platform.” It was founded in 2014 by Max Ventilla, a former Google executive. AltSchool has raised $133 million in venture funding from Zuckerberg Education Ventures, the Emerson Collective (the venture philanthropy firm founded by Steve Jobs’ widow Laurene Powell Jobs), Founders Fund (Peter Thiel’s investment firm), Andreessen Horowitz, and others. As opposed to the traditional approach of selling or licensing technology to established organizations, the full stack startup builds and manages a complete end-to-end product or service, thereby bypassing incumbents. 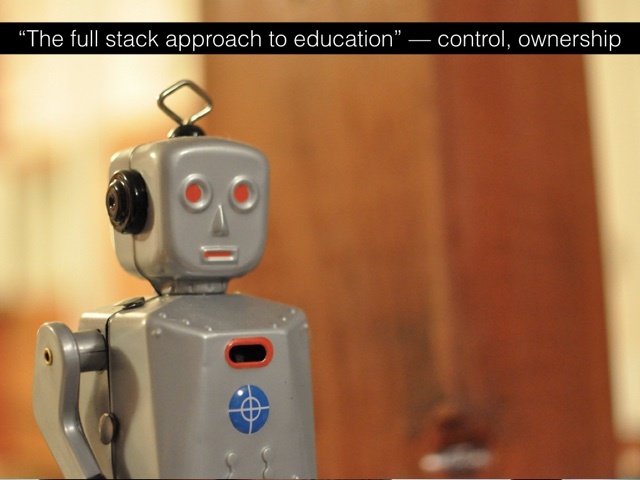 So why take a full stack approach to education? While the company initially started as with aspirations of launching a chain of private schools, like many education startups, it’s had to “pivot” – focusing less on opening schools (hiring teachers, recruiting students) and more on building and selling software (hiring engineers, hiring marketers). But it retains, I’d argue, this “full stack” approach. Rather than thinking about the platforming of education as just a matter of centralizing and controlling the software, the data, the analytics, we have this control spilling out into the material world – connected to sensors and cameras, but also shaping the way in which all the practices of school happen and – more frighteningly, I think – the shape our imagination of school might take. Platforms are not substitutes for community. They are not substitutes for collective political action. We should resist the platforming of education, I’d argue. We should resist because of the repercussions for labor – the labor of teaching, the labor of learning. We should resist because of the repercussions for institutions, for the law, for democracy. 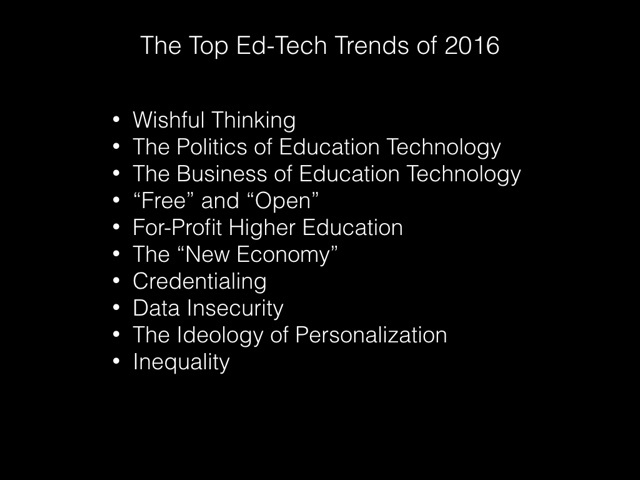 And these are the things I try to point out when I select the “top ed-tech trends” – too many other people want us to simply marvel at their predictions and products. I want us to consider instead the ideologies, the implications.